 A fable from one of the few writers of Christian fiction to publish in the mainstream press, more recently known for his ongoing spiritual autobiography, The Sacred Journey (1982), Now and Then (1983), and Telling Secrets (1991). Buechner's fable is based on the apocryphal book of Tobit, an account of early Judaism from the second century b.c., when the Jews were an enslaved people. 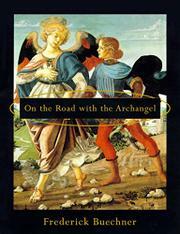 Raphael, one of the seven archangels, narrates Buechner's gentle story with humor and frequent asides about the nature of the Holy One. Raphael's task is to gather up prayers and carry them to God, then carry replies back if replies must be made. This results in some extraordinary passages: the prayer of a dog, for instance, to better please his master, and that of a gigantic fish, in gratitude for the mud and weeds around him. But two prayers in particular form the basis for Raphael's sojourn on Earth--and for Buechner's story. A young woman, Sarah, loves her father so dearly that she doesn't want to be married, and summons a demon who, on her seven wedding nights, kills each of seven bridegrooms. But Sarah is so filled with guilt over these deaths that she prays to God to be killed. Meanwhile, a poor blind man, Tobit, also prays for death, to relieve his miseries and to allow his family to resume normal life. He enjoins his son to undertake a perilous journey both to retrieve a fortune and to find a wife. The son, the amiable, less-than-brilliant Tobias, dutifully starts off. Raphael then joins him, securing the fortune and helping Tobias to court Sarah, devising antidotes both for demons and for the blindness of Tobit. Buechner, a Presbyterian minister, emphasizes the goodness of God, playing down suffering, playing up faith. A slight tale, though often quite charming.